The IBM-patented 8b/10b method used by ARINC 818 to date encodes 8-bit data bytes in 10-bit transmission characters to improve the physical signal. This encoding is also used by Fibre Channel, Gigabit Ethernet, 10 Gigabit Ethernet, ATM transmission, and other interfaces. The alternate encoding, 64b/66b, will be used in the future by extremely high-speed ARINC 818-2 applications: 14.025 Gb/s, 21.0375 Gb/s, and 28.05 Gb/s. Part of the Object 0 payload, ancillary data is a minimum of 16 bytes and carry information used to define the video parameters implemented, such as the video resolution and update rate. When all special characters and vertical and horizontal blanking areas are removed, the active image area remains (see illustration, top of page). The acronym derives from Avionics Digital Video Bus and signifies anything relating to ARINC 818—e.g., ADVB frame. For transmission, one video frame is broken down into multiple ADVB frames, each of which includes a payload limited to 2112 bytes. For example, an XGA image has 3 bytes/pixel and 1024 pixels per line, a total of 3072 bytes. Thus it requires two ADVB frames per line, each including a payload of 1536 bytes. ARINC Specification 818-2 standardizes innovations in prior custom ARINC 818 implementations, enabling compression, encryption, greater speed, and other features. It is the current version of ARINC 818, published in December 2013. Four object types are defined within ARINC 818. Object 0 carries header data; Object 1 carries audio data (but isn’t usually used); Object 2 carries video data; and Object 3 also carries video data, but is only used for interlaced video. The term CRC applies to algorithms based on polynomial division. The essential mathematical operation in the calculation of a CRC is binary division, and the remainder from the division determines the CRC. CRCs cannot, however, be safely relied upon to verify data integrity. FC-AV is an older standard (ANSI INCITS 356-2002). Each of its implementations is unique. ARINC 818 built on FC-AV, moving toward more standardized but still extremely flexible systems. This term is potentially ambiguous when used alone in an ARINC 818 context. Instead, specify Video frame or ADVB frame. In analog systems, the time needed for an electron beam of a cathode ray tube (CRT) to move left from the end of a completed line to the beginning of the next line. In the digital world, horizontal blanking is not as necessary, but most systems retain it. The horizontal blanking is controlled by inserting idle ordered sets. Adopted from CRT technology, a line is draw left to right. Indicates the start of the row timing within the video frame. The document required to define parameters for each ARINC 818 implementation. By providing for interoperability of system components, it enables the extreme flexibility of ARINC 818. An ICD defines physical medium, connector type, link speed, pixel dimensions, color model, scan type, frame rate, synchronization and segmentation class, and detailed timing parameters. These sets are pre-defined 4-byte sequences that define special control characters—for example, a start-of-frame or end-of-frame ordered set. The data in an ADVB frame immediately following the header and preceding the CRC in the footer. See illustration with ADVB Frame. ARINC 818-2 accommodates vertical and horizontal banding and tiling, which can be used to give special characteristics to a region of interest within a video frame. For example, a region of interest can have a higher frame rate than the frame as a whole. The cumulative number of ones minus the cumulative number of zeros that have been transmitted on the ARINC 818 serial link. Each byte of data feed to the 8b/10b encoder will have two possible 10-bit output codes. Typically these codes will be one with 6 ones and 4 zeros and one with 4 ones and six zeros. (Another possibility is a neutral code with 5 ones and 5 zeros, which does not affect the running disparity.) For each input byte, the 8b/10b encoder will choose the 10-bit code that keeps the running disparity between -1 and +1. 8b/10b encoding employs two types of characters, data and special characters. When a character is converted from eight bits to ten bits, the serializer must be told if a byte is data or a special character by asserting a given pin on the serializer. Common special characters are used to indicate start of frame, end of frame, start of line, end of line, idle, or other control characters. The special character K28.5 is used as the first character of all ARINC 818 ordered sets. Like Horizontal blanking, this term comes from analog technology. The time required to reposition the electron beam from the lower right hand corner, to the upper left hand corner is the vertical blanking. In the digital world, the vertical blanking is the time between video frames. For example, if transmitting at a rate of 30Hz, a new video frame will be sent every 1/30 of a second. If the entire time needed to transmit the frame is 1/60 of a second, another 1/60 of a second is left over before beginning the transmission of the next video frame. The vertical blanking is accomplished by inserting idle characters. Adopted from CRT technology, lines are drawn from top to bottom. 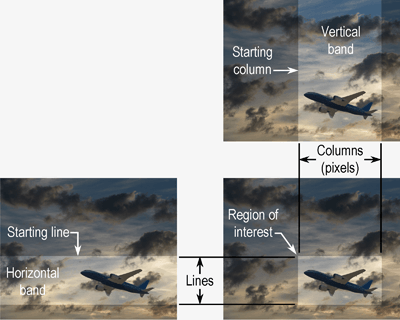 Indicates start of a video frame—that is, start of the image container. See the Video frame components diagram above. 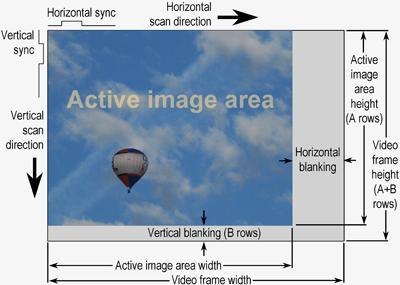 In the video world, a frame is considered to be all the payload information needed to describe an image. This is not equivalent to a container in the ARINC 818 world. The video world frame should not be confused with the ARINC 818 world frame. See the ARINC 818 video frame components diagram above.